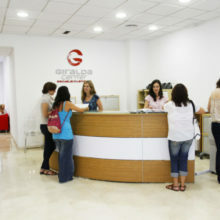 Giralda Center is the oldest Spanish language school in Seville with more than 30 years of experience. The school has a modern building with 18 classrooms and it's located in a privileged area in Seville. It's also an international languages center with students from more than 25 different countries, having a wonderful international atmosphere, it's an amazing school to learn Spanish in Seville. Medium intensity means you'll have a perfect balance between free time and study pace at Giralda Center. You’ll be able to enjoy your life in Spain, while learning Spanish very quick. Take a break on one of the Giralda Center open-air roof terrace. Chill out and chat with your friends or simply enjoy the views of the city's terracotta rooftops. 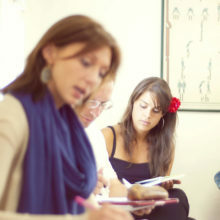 Sometimes classes can take place there, it's the perfect spot to learn Spanish in Seville ! Seville is the capital and largest city of Andalusia. It has 3 UNESCO World Heritage sites including: The Alcázar Palace, Seville Cathedral and the General Archive of the Indies. The city is situated in the valley of the famous Guadalquivir River and approximately 90 km away from the Atlantic Ocean. Two of the most famous Spanish festivals take place in this city. In the weeks leading up to Easter the first festival, Semana Santa, also know as Holy Week takes place. Processions are held with floats depicting life like replicas of scenes from the Passion of Christ. The second festival is usually about two weeks later and is called the Feria de abril de Sevilla, also refered to as the Seville Fair. During this much anticipated time of year, local people and businesses set up marquees, where people enjoy drinking, dancing and socialising. This Spanish language school in Sevilla is conveniently located in beautiful area, directly across from the Royal Alcazar Gardens, only 100 meters away from the University of Sevilla and less than a 10 minutes walk away, from the famous Seville Cathedral and Plaza de España. The course at Giralda Center includes 20 classes per week, consisting of 4 daily classes each lasting 55 minutes, and an average number of students per class ranging from 6 to 10 people. The best thing is, you get up to 10 hours of cultural activities / language workshops per week included for FREE. 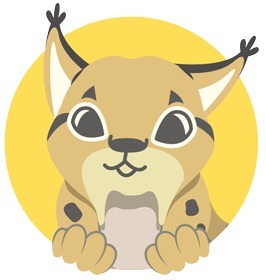 The main goal of the course is to develop the student's ability to communicate. By using an immersion method, by teaching you the language and grammar, you then put what you've learned into practice. Combine the general course with a practical cooking class, flamenco dance class or with other activities. Up to 10 hours of FREE cultural activities / language workshops per week are included on the Giralda Center course. Note: The total costs above include class, staff support and some school activities. Books and study materials are also included.